Another Christmas card today. This time I went in the Country Christmas direction. The image is one I printed last year from The Graphics Fairy, I have added some real stitching to the panels, as I have been much braver with my sewing machine since my talented bloggy friend Anne of Redanne did up a post about using sewing in crafting. You should really check that out here. THANKS ANNE! The papers are from Michaels Craft Store. The green is from My Minds Eye - Holiday Cheer, and the music notes paper is from DCWV - The Primrose Stack. The doily is from Prima, the flowers are from Wild Orchid Crafts, the laces are from May Arts and everything else is from my stash. I picked the miniature pine cones myself, how awesome is that!! I couldn't find any information on the internet about if picking pine cones is harmful to the trees or not, so I only took a few. If anyone has some knowledge about this, please let me know. There were such fun paths, old ruins and amazing trees, it felt like being in some enchanted forest straight out of a J.K. Rowling's novel! BUT THEN WAS THE UPHILL HIKE BACK TO THE CAR. DOH! Back on the home front our little baby sparrow has decided it's much easier to take food from the balcony than bother with flying up to the feeder. So sweet! I FINALLY HAD MY FIRST WOODPECKER!!!! YAY!!!! This little guy is a Downy Woodpecker with just a small patch of red on his head. PATRICIA has quickly become one of my favourite little visitors. She just loves to play hide and seek in the tree, and watch me as I go about my daily routine! I can't help but smile when I see her peeking out from behind a branch! Oh SKITTLES, how cute are you! Be very very quiet, something has caught the full attention of dear MR BAGGINS! I'm not even sure what to say about JUNIOR today... I think this photo is worth a thousand words! Your card is amazing. I love all the dimension and details. Great job! And you made wonderful photos again. 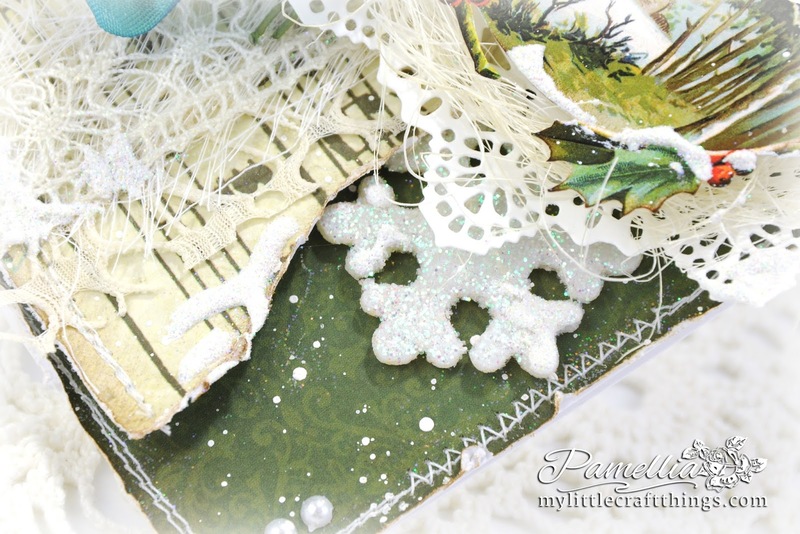 I am loving your Christmas in July cards, Pamellia!! This one particularly captures my eye. It is so sweet and vintage. All the layers and texture have me wishing I could reach up and touch it! I have a Downy family at my feeder as well. I've started keeping a list of my little visitors, but I haven't named my squirrels yet--lol! I love that you named one Mr. Baggins!! A very beautiful card and well done on the stitching it looks amazing. Thank you for the link to learn how to do I will be going there after commenting here. 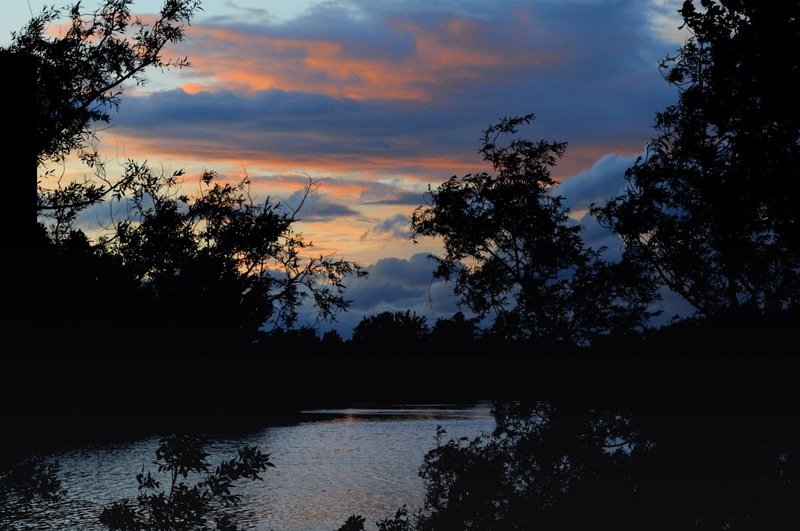 Love the photographs with the many quiet retreats that you find along life's way. Great to see a woodpecker as well. We hear lots of them when we are out walking but I have never even caught a glimpse of one yet. Oh what a gorgeous card Pamellia - as for Junior.... no words for that one - he is a comedy act on his own. Stunning christmas card...again! Love how you've framed the peaceful little scene with all those beautiful elements..the little pine cones look gorgeous - and real stitching too! Those forest walks look wonderful, can see what you mean about the Harry Potter novels- there's something so mystical and mysterious about trees. As for Junior...well what can you say!!! Beautiful card, Pamellia! I don't know if it hurts the tree to pick pinecones. I do know that years ago, an aunt of mine collected some outdoors to make a wreath. The next morning, the room was covered with spiders. Apparently, you should bake them first in case anything is in them ready to hatch. Junior is too funny. I enjoy these pictures. 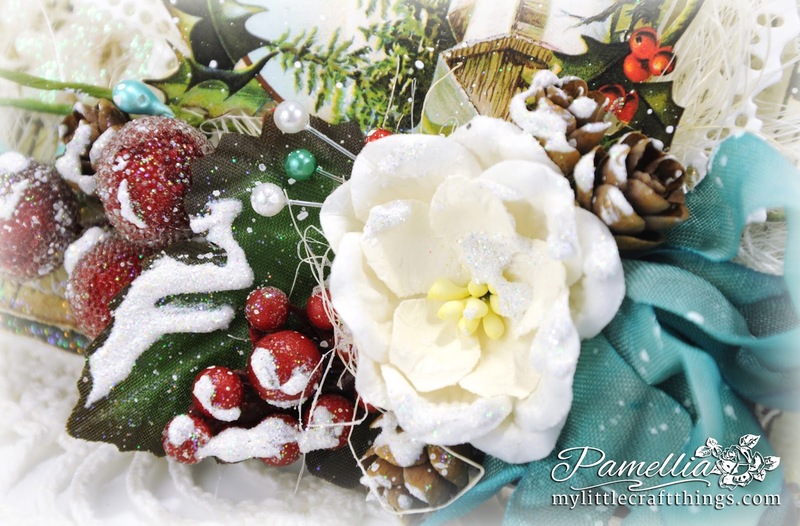 Another beautiful Christmas card Pamellia! The image you used looks like landscape of your neighborhood :) and all they gorgeous layers of papers and embellishments make this card a showstopper! Awwww.... 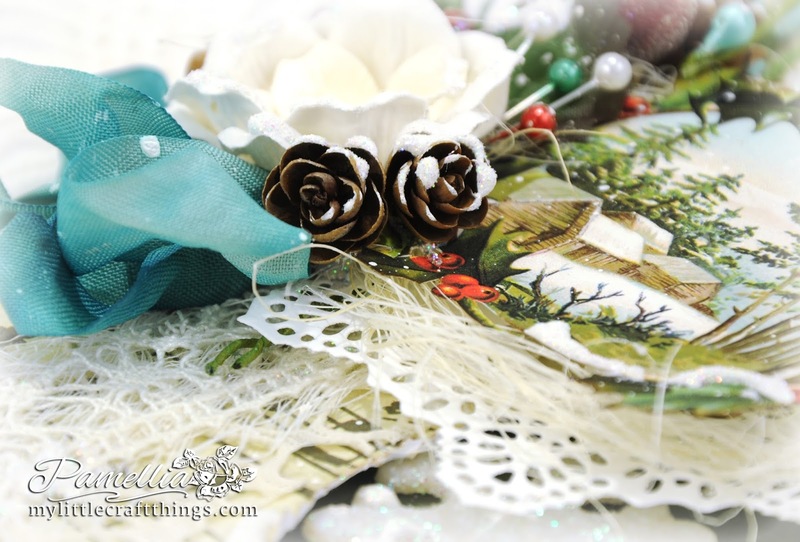 This mixed media card is just magical! Such a fab scene you have created with this wonderful image and all the things added!! Great design!!! Your true little pinecones look amazing!! This is beautiful. I love the beautiful winter scene you created along with the floral arrangement. Its Beautiful ,cosy Christmas card ! 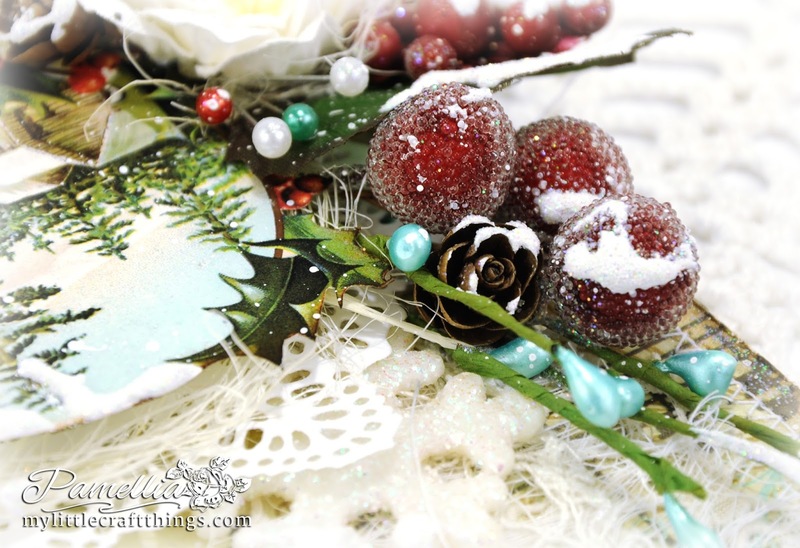 The papers give it a vintage look and I loved the "snow" on embellishment and lovely addition of real pine cones ! Beautiful card! So many lovely elements. Wonderful photos too! 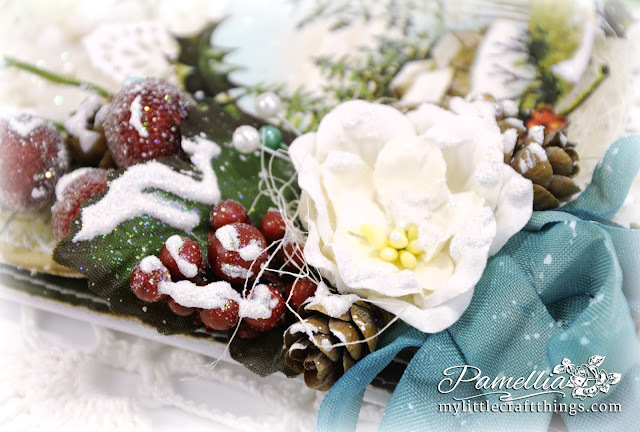 Oh my goodness, Pamellia, your card is absolutely stunning!! Wow!! The vintage country look is amazing!! I love the image...so peaceful and beautiful!! You've showcased it perfectly!! The layers and details are spectacular!! I'm not kidding when I say it takes me so long to comment...I study each picture to absorb the details!! Your stitching is perfect!! Love, love, love this my friend!! Beautiful card Pamellia and love your little pine cones and all the snowy glittery textures..what CAN I say about Junior..lol..he is a character!! Stunning card, love the design. Oh my adore that photo of Junior, he has to be my favourite lol! An awesome card, great stitching with all those beautiful layers. Your photos from your walk look lovely and as for Junior, he gets a gold star from me today, he is simply adorable. 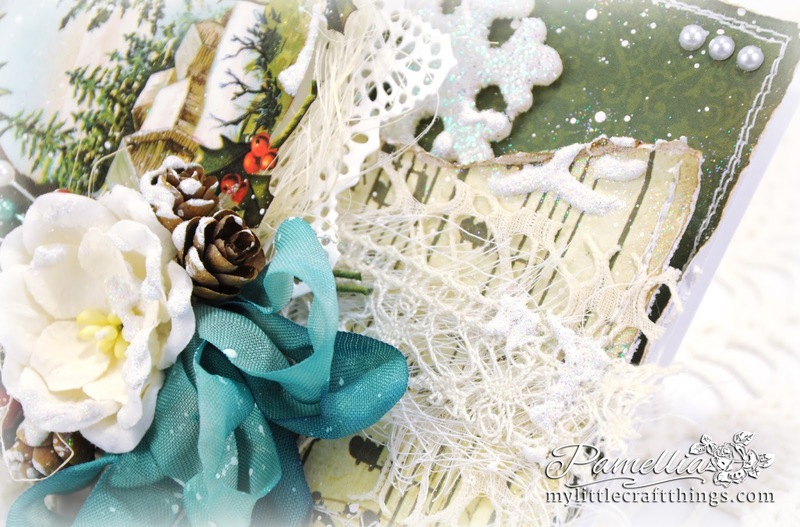 An amazing card, love the beautiful layers, details, traditional colours and snowy features. A super addition to your Christmas collection. 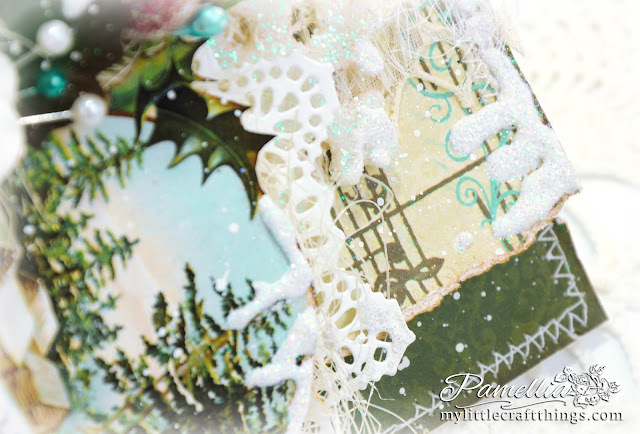 Oooh gorgeous card Pamellia, could do with some of that Winter chill today as it's so hot here in the UK! Ah Junior cracks me up, I'm surprised he's ever awake long enough to eat! This is sooo gorgeous Pamellia! love all the gorgeous layers with that beautiful image and floral arrangement..
You have some beautiful places to visit around you, these photos are fabulous, so are you cute furry feathered friends. Such an exquisite Festive creation and a stunning floral arrangement. Junior is so funny, I just adore him! Beautiful Christmas card, I am loving the stitching, I have never been brave enough to use my rather precious (that's precious as in it can be very temperamental, not that it is dear to me) sewing machine. Wonderful beads and lacy bits, and I LOVE your tiny pine cones. Absolutely brilliant Christmas card, Pamellia! I so excited to see that you used your sewing machine and your stitching is fabulous! Your tiny pine cones are cherry on top! I am always amazed by your fantastic layering and perfect embellishing! What a spectacular card this is, my friend! Thanks so much for your fabulous photos! Always love to see your little friends! You really have captured a vintage country look in this beautiful card Pamellia, the papers themselves are beautiful but it is always your embellies that catch my eye. Adding real pine cones is such a lovely idea (not sure if it does harm to the trees, although they usually all drop off anyway.... so the animals can move the seeds around the forest). And, of course, your stitching is wonderful - well done for having a go because it is a wonderful finishing touch! Thanks so much for the shout out too! What a very beautiful card, so traditional and so many layers and the stitching? too many things to pick up on, so I will say EVERYTHING is GORGEOUS. Your squirrels are a joy and as for Junior!!!!!!!! such fun. Fabulous scenery and don't envy you the walk up hills. Gorgeous sunset too, love coming here, SO much to see. 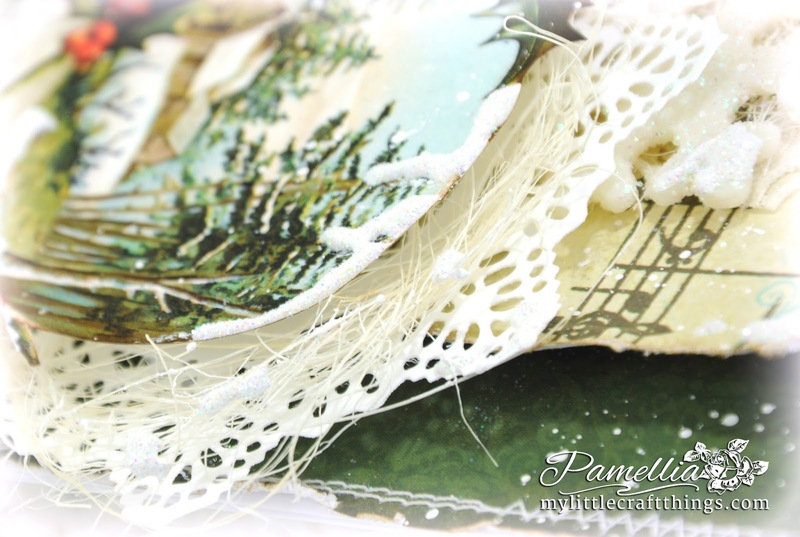 A beautiful Christmas card Pamellia. The image is so charming and the frosted elements look amazing. How wonderful to be able to use your own hand picked diddy pine cones. Stunning Christmas card Pamellia, love the addition of the little pine cones (they fall off eventually) Looks like a lovely peaceful place for your walk and today's photos of the 'family' are just so sweet, especially Junior! Another gorgeous card, and your foto... wow. Very sweet. Your acorns look perfect. j. You amaze me Pamellia with your talent you make the most amazing creations, the embellishments are stunning. The photos are gorgeous . 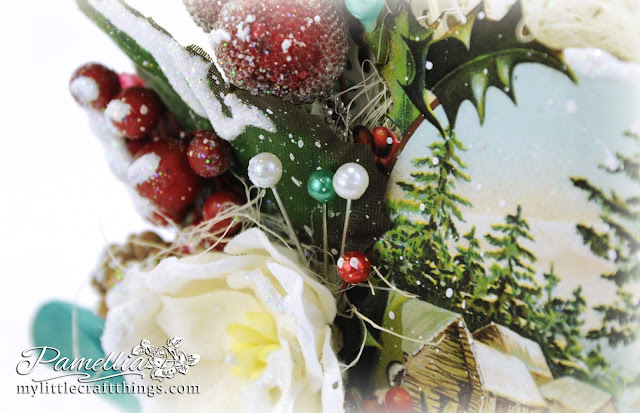 Fabulously festive and the addition of your hand picked baby pine cones is inspired. Well, what can I say about Junior? Any squirrel confident enough to have his bits on display is obviously comfortable in his environment lol! Fabulous card and nature pictures. Love all the close ups you get of our furry ans feathered friends. The only thing wrong with this card is that it didn't come with a video. i am sure one is coming soon, but in the meantime I will just watch one of your old ones. lol. Beautiful design as usual love the real pine cones and the red berries and of course the sewing and all the fabulous layers. Fabulous pictures too. Just love visiting your blog. Lovely card, I like the music note paper and the baby pine cones are adorable. The pine cones have seeds that some birds eat, at least the bigger ones do. I think I might bake them before I use them, like that other lady said, just in case. I like your nature photos. That Junior! I have never seen their little hands (feet?) in such detail. Gorgeous card Pamellia, wonderful design. Oh, dear Junior! He had me giggling! What sweet tiny feet! He looks as if he has had enough of the northern heat! Perhaps he would enjoy a trip to Wilmington to cool off??? Your baby starling is so sweet, and you have captured his/her beauty with your wonderful photography. Love seeing all your shots of your trip through the woods; indeed a magical setting! We hiked though a similar looking Christmas tree forest on our vacation, but the path was not so clearly marked. If you don't pay close attention you miss the blazes on the trees marking it, and can easily get lost. Those steps look enticing, and I think my curiosity would have gotten the best of me! I never tire of your coffee/after dinner shots, either! As for your amazing Christmas card, it is full of nostalgia and nature--two things I love! The colors you've used are perfect and the image is indeed beautiful! Love to see the stitching, and am currently working on a project that should have some stitching on it. I'm checking out a machine I was given a while back and have forgotten about. Fingers crossed it works! I have been pricing new machines, and I just can't swing one just yet. Big hugs to you, Pamellia!